Julie Dawkins Family: I've almost made it! I haven't done much crafting...more purchasing. 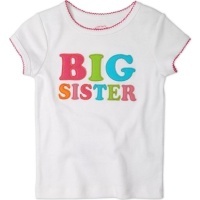 Like today I bought some "big sister" decals to iron on to a shirt for Savvy (apparently you are not supposed to be a big sister at 20 months) but then I made her try on a 3T shirt that I thought may work if I wash it in hot water! For $1.80 (on major clearance!) I thought it would work just fine! And it is cuter than the decal anyways. Yeah! My list is getting shorter...now how else can I avoid packing???? I just hate to pack.